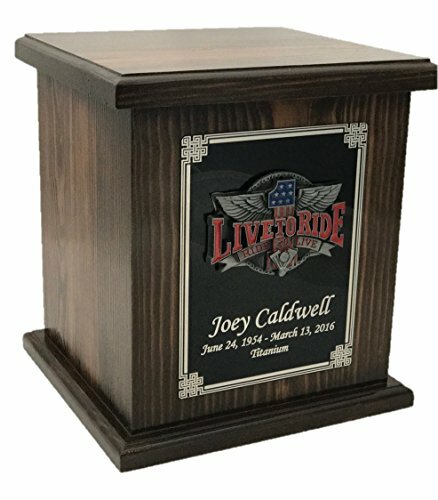 Large size Hardwood Funeral Cremation Ash Urn with Live to Ride, Ride to Live 3-D emblem Memorial urn, bottom loading. The bottom panel is secured with four screws. FULL SIZE ADULT URN, can hold a body weight of up 250 pounds before cremation. Outside dimensions: 9.5"x 8.5"x 7", 250 cubic inch capacity A custom engraved plate comes with it at no extra charge. Please select the option to customize the product before adding it cart. Memorial urn, bottom loading. The bottom panel is secured with four screws. A custom engraved plate comes with it at no extra charge. Please select the option to customize the product before adding it cart. If you have any questions about this product by NWA, contact us by completing and submitting the form below. If you are looking for a specif part number, please include it with your message.